We offer a boutique oceanfront garden setting for six bungalows & their options. Book your holiday stay on the north shore of Oahu where a half mile of quiet beach is only steps from your bungalow. We offer consistency throughout our bungalow collection. Each is intimately set in the garden on the beach front and beach side. Our most panoramic ocean views and directly on the beachfront! The Ocean Sun is directly on a sandy beachfront with views of the moon and sunrise on the ocean's horizon and is the perfect location for your weddingmoon or just extended romantic vacation get away. Right out your front door is your personal patio for relaxing in the sun or winter and spring whale watching. The Ocean Sun has a fully equipped kitchen with Viking gas stove with convection, all kitchen and cooking utensils, microwave, high end pots & pans, large refrigerator with filtered water. Designed with stunning stone counters and ample cabinetry in kitchen for extended vacations or honeymoons. Beautifully furnished with modern comfort seating mixed with century old antiques from Morocco, Indonesia and China, flat screen HDTV, cable, complimentary wireless high speed internet, on-site laundry facility, outdoor grill and picnic area and large Koi pond. Endless activities include snorkeling, swimming, lounging on beach (complimentary beach chairs), fishing, complimentary kayak, hiking, watching sunsets, enjoying our on-site gardens, surfing and body boarding in winter months and so much more right out your front door. With 2 local grocery stores nearby, you won't even need to leave the ocean front property! Aloha! White, sandy beach with private beach access, crystal clear, blue, warm water and gentle surf all year long, makes this place honeymoon & family perfect any time of year. You won't want to leave! Three bedrooms, three baths. A television in every room. All the comforts of home. A fully appointed kitchen, modern appliances, complete utensils, pots and pans. The master bedroom has a Serta mattress, Cal. King size bed with ocean view, the second bedroom has a Queen Serta mattress, with garden view and the third bedroom has 2 twin size Serta mattresses (we can combine both beds to king size) with a view of the deck, ocean and back yard garden. Two full size futons in the living room, and a Pack & Play collapsible play pen for infants. Free, secure cable internet plus secure WiFi and cable TV. This is the same home as the ALOHA SUNRISE 2 but with one of the bedrooms locked out to accommoate guests only needing two bedrooms.Included are 2 bedrooms and 2 baths.. A television in every room. All the comforts of home. A fully appointed kitchen, modern appliances, complete utensils, pots and pans. The master bedroom has a Serta mattress, king size bed with ocean view, the second bedroom has a Serta mattress, queen size bed with garden view. This is the same home as the ALOHA SUNRISE 3, but with the second and third third bedrooms locked out for those guests needing only one bedroom. A television in living room and the bedroom. All the comforts of home. A fully appointed kitchen, modern appliances, complete utensils, pots and pans. A few steps to the beach through our garden and very nice ocean views. This bungalow is a stand alone studio home. 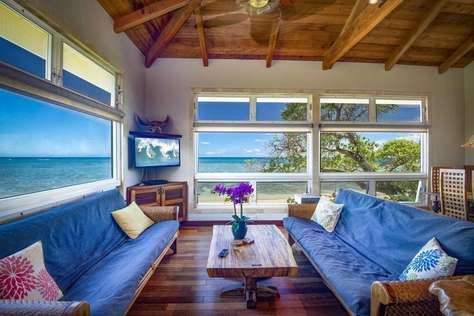 Beautifully furnished and spacious studio bungalow with a large private patio and beach access from the gardens and ocean view is only 90 feet from our sandy beach front. The Coco Bungalow is air-conditioned and spaciously fitted with island wood craft furnishings, California King Bed with high thread count linens, full size sofa sleeper, full kitchen with a range, refrigerator, and an array of cooking utensils, microwave oven, stainless pots & pans, flat screen HDTV, cable, complimentary wireless internet, on-site laundry facility, outdoor grill and picnic area and beautiful Koi pond. Large Studio With No Adjoining Walls! 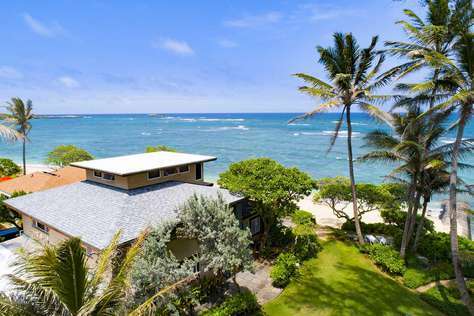 The Bamboo 2 is an incredible ocean side vacation rental with direct views of the ocean and direct access to Laie Beach right out your front door. Decorated with 100 year old antiques from Java and China, mixed with modern comfort furnishings make this a great retreat spot for couples or families. This North Shore rental contains a large and fully furnished kitchen with stone countertops with teak cabinetry and an extensive line of cookware and dinnerware. Flat Screen HDTV in bedrooms and living area, free high speed wireless internet, built in quiet Washer and Dryer including soap and fabric softener, outdoor grill and picnic area and peaceful Koi pond. Endless activities include snorkeling, swimming, lounging on beach (complimentary beach chairs), fishing, complimentary kayak, hiking, watching sunsets, enjoying our on-site gardens, surfing and body boarding in winter months along with whale watching and so much more right out your front door. With 2 large local grocery stores nearby. 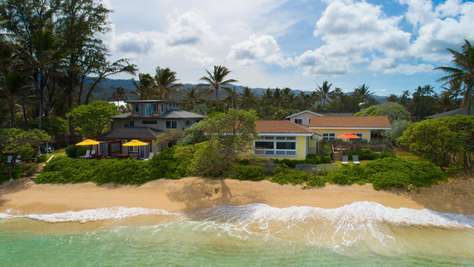 The Bamboo I is an incredible ocean side vacation rental with direct views of the ocean and direct access to Laie Beach right out your front door. Decorated with 100 year old antiques from Java and China, mixed with modern comfort furnishings make this a great retreat spot for couples or families. This North Shore rental contains a large and fully furnished kitchen with stone countertops with teak cabinetry and an extensive line of cookware and dinnerware. Flat Screen HDTV in bedrooms and living area, free high speed wireless internet, built in quiet Washer and Dryer including soap and fabric softener, outdoor grill and picnic area and peaceful Koi pond. Endless activities include snorkeling, swimming, lounging on beach (complimentary beach chairs), fishing, complimentary kayak, hiking, watching sunsets, enjoying our on-site gardens, surfing and body boarding in winter months along with whale watching and so much more right out your front door. With 2 local grocery stores nearby, you won't even need to leave the Bamboo Hale I! Aloha! Only a few more steps to the beach through our garden from your back door! "Papaya 3" a beach side home with garden views. 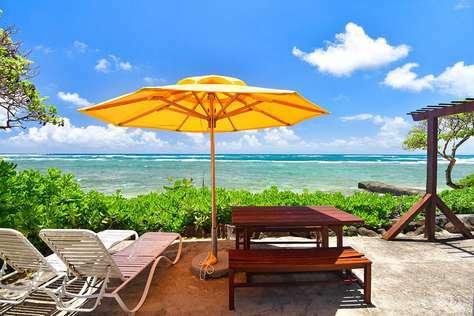 Boasts a private patio with direct access to the beach front and ocean. 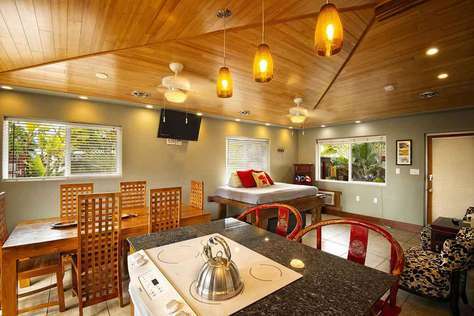 This 3 bedroom vacation home on the North Shore is tastefully furnished with full size refrigerator, contains an array of kitchen and cooking utensils, An eight person dining table, microwave, pots & pans, flat screen HDTV, cable, free wireless high speed internet, complimentary washer & dryer with detergent and softner, outdoor grill and picnic area and amazing Koi pond. 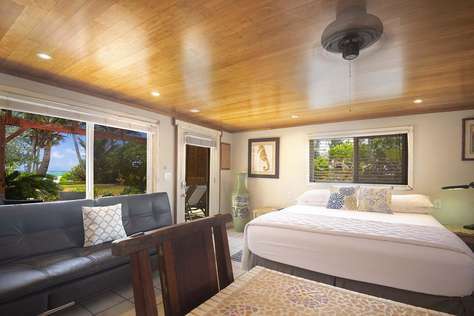 The Papaya 2 located on the Ocean Side of Tiki Moon Villas is right across from the Polynesian Cultural Center and is perfect for family or small group of friends. 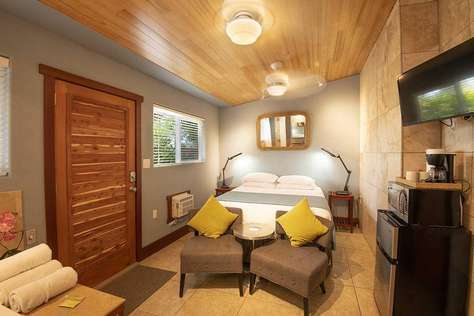 This two bedroom vacation rental on the North Shore with a private patio is tastefully and beautifully furnished. The full kitchen is an open floor plan including the living area and great for entertaining and relaxing with your group. Simple activities include snorkeling, swimming, lounging on beach (complimentary beach chairs provided, complimentary kayak, hiking, watching sunsets, enjoying our on-site gardens, surfing and body boarding in winter months along with watching whales and so much more right out your front door. With 2 local grocery stores nearby, you won't even need to leave the Tiki Moon Villas property! Aloha! All the access to the beach and gardens: a few steps to the beach. Watch the sunrise from our beach! This room has a large whirlpool tub and shower in the bedroom. It is our version of a hotel room with street side & mountain views, the Polynesian Cultural Center and mountains in the background. BYUH and the Mormon Temple visitors center are nearby. See Kualoa Ranch where many famous movies were filmed. Quick access to Turtle Bay Golf courses or hire a beach boy to help you surf your first wave. See surf competitions at Sunset beach. Play at Waimea valley in the waterfalls.Take some time to visit the surfer town of Hale'iwa. Watch whales in the winter from our beachfront area. Many hiking trails are in the neighborhood and we can advise which trails to trek for your skill level. Suited for up to 2 guests in same bed (no extra roll away for this room). "Tiki Moon Villas Event 6" is comprised of six bungalows nestled within 32000 square feet (+3/4 acre) (+3000 square meters) of lush oceanfront gardens. Each professionally decorated bungalow provides guests with full kitchens, high-end linens, towels, beach towels, Tommy Bahama beach chairs, flat screen HDTV's, cable, free wireless high speed internet, complimentary washer & dryer access with detergent and softener, large outdoor grill. There are several activity areas including a place for a 30 x40 feet event tent provided by a vendor if desired. Water is the main integration to the gardens and includes 2 large koi ponds and 6 smaller water vessel features. Each beach bungalow is surrounded by tropical paradise, intimate with the beach & ocean. Reserving all six of the beach bungalow choices makes for the perfect space to experience your special event. "Tiki Moon Villas Event 6" sleeps up to 31 total guests comfortably with a maximum occupancy of 38 overnight guests. Our outdoor event space is ideal for up to 100 guests. Venue fee applies (up to $2200). Reserving "Tiki Moon Villas Event 6" is a venue of choice for family reunions, weddings, celebrations, small business and yoga retreats for the past eleven years. 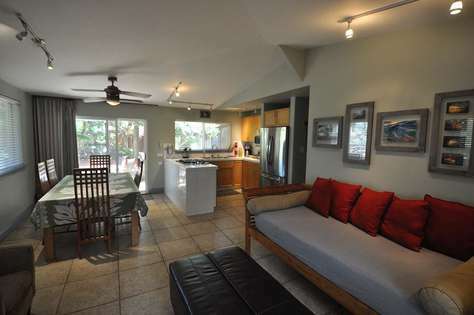 ALOHA SUNRISE 3: a three bedroom & three bath. sleeps up to eight. Bedding consists of: 1 Cal. King bed in bedroom #1, 1 queen bed in bedroom #2, 1 Cal. King bed in bedroom #3 (converts to 2 single beds), 2 queen futon sofa beds in living room. If you need a less beds choose: "Tiki Moon Villas Event 5"
​If you need a less beds choose: "Tiki Moon Villas Event 5"
Ready to book your stay? Check our booking system, availability, and cancellation policy. You can easily book a beach bungalow using our easy online booking system.